If you live in Montreal, you’ve certainly partied at the “Festival du cône orange” this past summer. You know what I mean. Construction and traffic everywhere you go. Detours, delays and irate, impatient drivers. It hasn’t been fun. Even in my own neighbourhood, there’s some infrastructure work going on. Streets dug up, water lines crisscrossing the roads, and our own festival of orange cones. A real party. I painted this on a sample of Fabriano Artistico paper that was shipped with my copy of Watercolor magazine. On the back of the sample it says “Try sheet (test other side)” and I always follow orders. If you received a copy too, be sure to answer their online survey, as they will send you more sample papers. Seems like a fair deal to me. How fun! We have this festival here, too. Supposedly my tax dollars at work for street widening…..whatever. Your painting is really lovely. I will have to think of it as I wind my around these confounded things! I don’t know where you live Lois, but I hope it isn’t as bad as Montreal will be for the next few years. It’s quite a mess. You can’t go anywhere without a big detour and some sort of traffic jam. I kept trying to look beyond the cones when I painted and then I realized that I should just include them in the drawing. And now I kind of like drawing them and I may even be sorry when they disappear. Shari–this is such a great attitude. I am in Florida. I think part of the time we keep up the roads for the tourists, but I know they need repair, no matter what. You have given me a whole new appreciation for my little orange friends. Your painting is really lovely. Love all the traffic cones in their various positions. I’ll have to check out my magazine when I get back home. I hope you find the paper Joan. It’s really nice. Sometimes I wonder what to paint… and then I am reminded by your amazing work that sometimes the most banal things make for beautiful sketches. Makes me feel like such a cone head! Lisa, when I have nothing to paint I always draw a bunch of stuff on my counter, or my dog. If I am sick of that, I buy cheap flowers. But that usually happens in the winter when I can’t get out. Unless it’s raining or snowing or too cold, I can always find a street scene to paint in my neighbourhood, including trash cans! Soni, it didn’t attach! Can you send me a link, if it is posted somewhere like on a blog or on Flickr? I’d love to see what you did. I fractured my wrist a few years ago and continued to paint. My wrist healed pretty quickly and I think it was because of the painting exercise it got. You can make such great statements from “mundane” objects – what colors did you use on the yummy foreground asphalt ? Soni, that grey was a combination of Cobalt Blue, Permanent Alizarin Crimson and Raw Sienna, I really poured it on with a very wet brush and kept adding pigment to create the sedimentation. We have had that festival here, too. It has been amazing, becoming a town of roundabouts so quickly….. I think many places have this festival. Did you sketch any cones? You could teach a course on just learning how to see. It’s a true gift. You inspire me to try and develop that potential. Lee, you are very kind. I don’t think I have any special talent in seeing. It’s just that after painting thousands of sketches the only things left are the dreaded orange cones! Just arrived from Edmonton and thrilled to have a name for the scene that greeted one on the taxi into town. Wow. Sorry to miss your sketch meet though. Hi Karen. Too bad you didn’t get to meet us, and really sorry to hear that you had to drive into our city when it is in this state. Hope you didn’t get caught in too much traffic. Oh how I laughed when I opened this blog!! Your title had me fooled into thinking this was a bona fide “iconic” festival in Montreal and I expected to see a bunch of people celebrating the autumn hues or maybe lining up for orange ice cream cones! Then I saw the cones, and I was still thinking: “Wow – must be so many people attending this festival they had to install pedestrian traffic cones”…..ha ha I’m still laughing! But hey – I seriously admire ALL your sketches regardless of subject matter! And, I’ll regard any cones I see henceforth with utmost respect! I’m so glad I gave you a little laugh with this. A question about your dark colors. Is it Payne’s grey or black ? Wow, I can’t wait to see your sketches. Hope you come to the next Sunday sketching and bring them along. I don’t use Payne’s grey or black. The darkest black I can make on my palette is a combo of Alizarin Crimson and Phthalo Green. That makes the best blacks and doesn’t dirty up the colours. Thank you for this great inspiration making fun out of the grinding day to day reality and finding a very colourful subject with the ordinary.What makes you a great artist Shari is, anything and everything in your surroudings is transformed into amazing art. Thanks so much Agnès. I was starting to really hate the cones. They disrupt my driving and even my walks with the dog, but I like them more now that I’ve painted them. This also made me laugh. So cones are orange there as well as in the USA. What if they were chartreuse? It does make for an interesting composition. They are orange here too Judy. Same cones, different city. I can’t tell you how we could not believe the traffic..I could never get there..thank goodness Jacques knows his way around..I don’t go far.. In Paris..one of the bridges had so many..and of course t prevent people from walking down to the flooded Sine.. I just tried a paper I liked but I like many..it came in my Cheap Joe’s Travel kit..seems it’s sold by them only..Kilimanjaro. Monique, I have a friend who has been telling me about Kilimanjaro paper for a long time but I haven’t tried it because shipping and duty can be so expensive from the US. He told me I would love it so one of these days I will try it! Thanks for the tip. I had to laugh when I saw your painting after reading the title of the post! We have the same mess in our city of over 2 million who all are driving at the same time of day, I swear. So many projects requiring re-direction going on that the news traffic person put up the photo of a construction zone with SO many cones she uttered: “Holy cones, Batman”…it’s become our favorite line when traveling through these zones….pure craziness! Have you sketched the cones Joan? I never knew how to use up my Pyrrol Orange, but the cones are that exact colour, in case you were wondering. 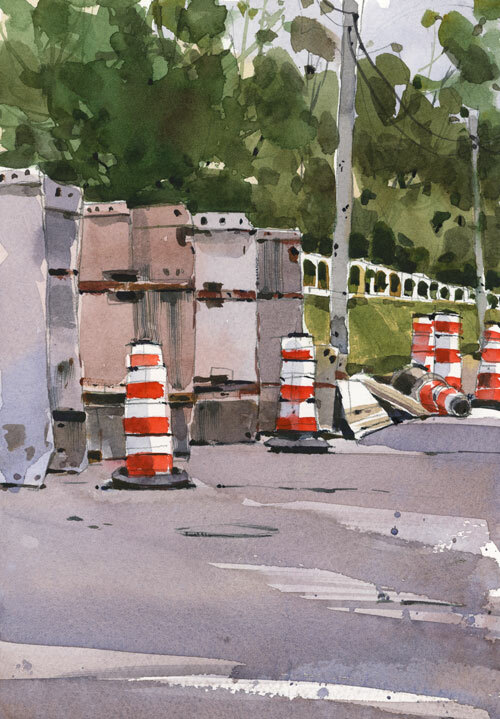 A non art question… where do all of those cones go when not in use? Think about it. Thousands and thousands of them, but where do they get stored? In Utah, we have orange barrels (not cones), and I’ve often wondered where the massive amounts of them are hidden. Area 51 maybe? Russell, knowing how much you research everything else, I am surprised you haven’t found out where these go at the end of construction season. Area 51 is a good suggestion for the US, but where do the Canadian cones go?? I guess I will have to look into that one. I doubt if Area 51 is large enough for all of the cones.